3. 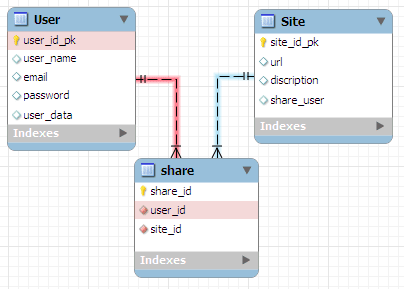 Define relationships and cardinality between the instances (records) of tables. These are only the main entities required from our project but, take a mind, that we will add other tables to store data about relationships between istances (records) of these tables in case of cardinality (M:M), many to many (see Step 3). USER > SITE (M:M) - Many to Many (an user can add many sites). SITE > USER (M:M) - Many to Many (a site can be shared by many users). Now, our database is ready to be implement with a DBMS (for example using MySQL). The next lesson will explains how to implement this database using SQL language. This is nice article but it is very very basic one and any novice user will be doing this thing only. I am not sure if your purpose of 'delicious' database design is solved here? Can you rather think of presenting a design of database/framework generic enough such that any one can design any kind of application with custom entities of his own choice quickly, along with UI related code (JSPs etc)? This way when I am writing any new application I shall not have to design/think of low level things like tables in database!